small adventure: Nice bike, guv'nor. Here is a photo of the Fonz's latest moto acquisition. 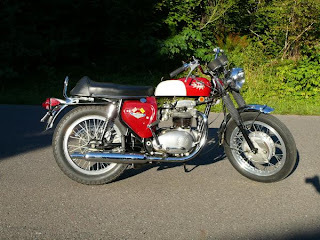 It's a '68 BSA Spitfire, and it used to belong to Dad of Fonz (who bought it new) until he passed it along to junior this year. A nice story, and a nice bike. Hey Fonz, did you say the controls are backwards on this thing? that is beautiful. Nuff said on that one...and a wonderful thing when dad and son can share the love of an old bike. Enjoy and keep it on the pavement!